This version of the history of Staples, Texas was compiled in 1970 and printed on the memeograph machine at the Methodist church in July of that year. It is now very out of date. Anyone who would be interested in helping update the history, or who has any documents, pictures, stories, anecdotes, etc. that they would like to share with the community is encouraged to do so. Just send an email to the webmaster using the link at the bottom of this page. Another short but interesting version by Al Lowman can be found at the Handbook of Texas Online History of Staples page. New! An update with more information about the Word family in Staples. The Word family figures prominently in the early days of Staples, and this contribution is very much appreciated. Remember when you could go to the store and by honey bottled in Staples? This space is available for news and announcements that may be of interest to the community. Anyone wishing to have a news item or announcement here may do so by sending an email to the webmaster via the link at the bottom of this page. Announcing a project of The Staples-Tuttle-Happle Cemetery Association the purpose of which is to share and preserve the history of the Staples area. Staples city council meetings are held on the 3rd Tuesday of every month at the Civic Center starting at 7:00 pm. We need all of your input and support. Visit GeoURL to check out web sites geographically nearby. The TXGenWeb Guadalupe County, Texas web site, TXGenWeb is a free site for genealogy. 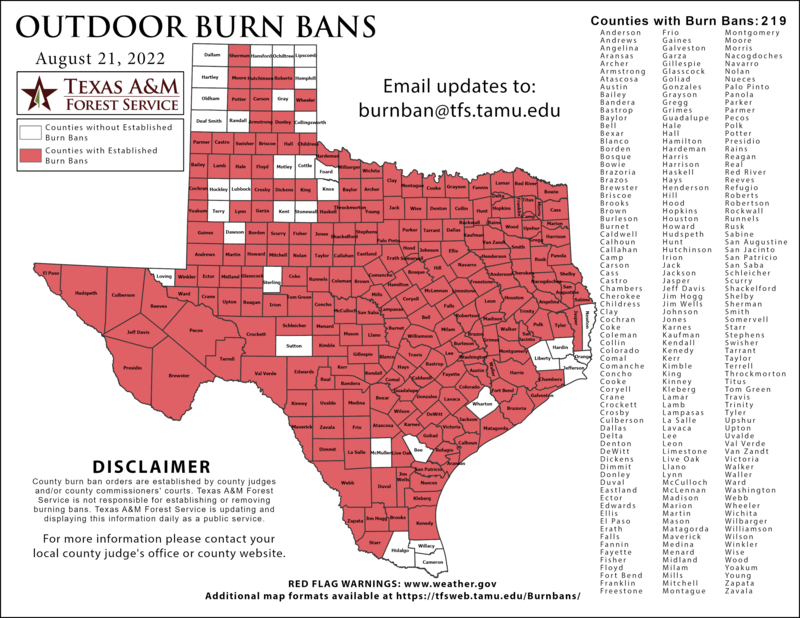 The Texas Forestry Service puts out a map of all Texas counties and their burn ban status on a daily basis. Anyone who has a website, or knows of a website they would like to see listed here, please contact the webmaster via the link at the bottom of this page.